One time, for a first date, we met at The Passenger for brunch on a Sunday. She showed up straight from a run (unchanged, unshowered), fell asleep eating, and then said she didn’t feel a spark on our date. I liked going there for dates because the dates were usually terrible and Alex, Julia, Jade, and K. Clare would help me figure out how it went (wrong). I’ve never really had a date or a girlfriend on Valentine’s Day. A few years ago I was dating someone over Valentine’s Day, but she was in Kentucky for the holiday and didn’t like flowers. That’s why we broke up, in the end, I tried to send her flowers, they called her cell phone for delivery (which she hadn’t turned off during a meeting), and she called me up screaming at me to dump me. 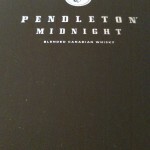 Back in October, I got an email about a Canadian whisky called Pendleton Midnight. I said, why, yes, I would like some, and they said, sure, here you go. 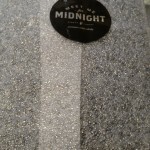 I got the box for it and put it on my coffee table and let it box age* ( * – not a thing) until, uhhh, last night. But then the other day they told me about a cocktail competition they’re hosting and I was like, oh, I should try this whisky. And write about it, obvs. And take pictures of it because PR/marketing folks are always like “we have hi-res images” and I’m always like “ha I got a cell phone and shaky hands” which is WAY realer than hi-res promo images, right? So I finally cracked her open and … wow. That’s some damn good whisky. It’s rich, smooth, and delicious. They have tasting notes in the booklet that came with it, but I’ll put it this way: I don’t know if I’ve had another Canadian whisky with the depth of flavor I got out of this one. It also came with some cocktail recipes, which normally I laugh at and throw away. I did the same thing here, but laughing in a good way: they’re three recipes. A Manhattan and an Old Fashioned are both listed, made in the proper ratios (IMHO) of 2-1 for the Manhattan and just a bit of sugar and bitters with the whisky in the Old Fashioned. The third is just two ounces, neat. Pendleton is imported from Canada and bottled by Hood River in Oregon. Some Googling didn’t lead me to know who distills it in Canada (not that it really matters, to be honest, as they’re not claiming to distill it themselves – I just like to know). 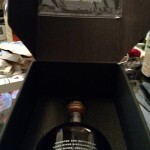 But with all that branding and such, it boils down to that it’s a smooth, delicious whisky even neat at 90 proof. 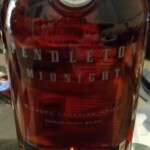 That’s why this year my date for Valentine’s Day will be Pendleton Midnight Whisky. Unlike that time I went to Estadio on a date and she told me that she was going to start a website calling out servers and bartenders by name and establishment if she didn’t get good enough service, I will probably instead drink it alone. Like the aftermath of so many bad dates, it’ll probably end the same, with me entirely too drunk, helping to donate to charity, then sleeping alone. But hey, sometimes that’s all a guy needs on a Valentine’s Day night.